Obviously the House of Tomorrow wasn’t meant to be part of everyone’s tomorrow. 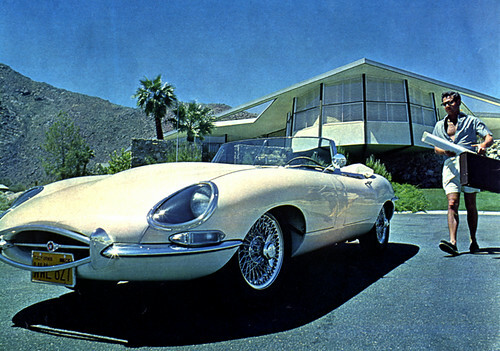 Nice Jag. Nice unbuttoned look, too. That’s the developer, Bob, with his wife Helene in their 1960 Desert Modern-style house in Palm Springs by Palmer & Krisel, architects. From here. The photographs originally appeared in Look Magazine. 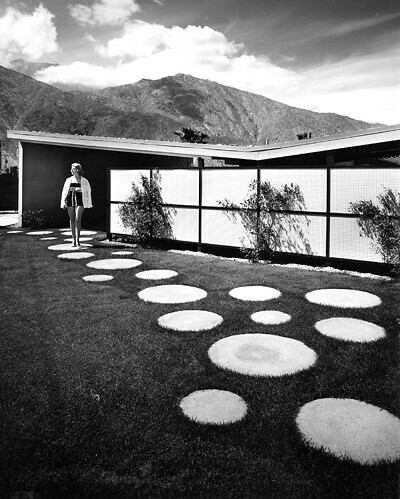 The third photo is actually from a different Palmer & Krisel house in Palm Springs. This entry was posted on Saturday, April 4th, 2009 at 1:51 pm	and is filed under design. You can follow any responses to this entry through the RSS 2.0 feed. You can leave a response, or trackback from your own site. A beautiful optimistic look towards the future. These homes might have many faults, but you certainly can’t fault them on style, it oozes out of them! Definitely an optimistic look towards the future and the style, but I don’t understand or agree with your comment about the homes having many faults. I live in one of these and don’t have any issues. I haven’t seen any faults. Their designs with the deep overhangs and breezeways naturally cool the homes in the summer and window walls warm them in the winter. I don’t see the faults either, certainly not in these ones, though I imagine John means the cheaper knock-offs. We see those in Vancouver, the sort of cheaply-made generic copies finished with poor materials that age badly. I’d live in the House of Tomorrow today. It’s still very tomorrow.